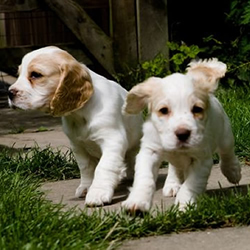 From time-to-time we have full and part trained working Cocker Spaniels and Labradors for sale as well as puppies. We offer backup after our puppies are sold, to any question that may arise and basic training instructions given . Also we will try to find them a new home if your circumstances change. A £100 non-returnable deposit secures your choice of pup. We will not be having any cocker spaniel pups in 2019 . but do have a litter of Labrador pups [which are never chocolate in colour].